James is already four months old! 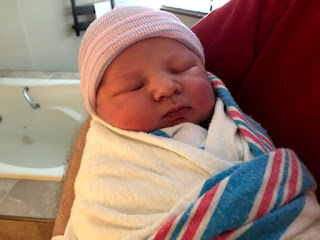 I thought I should write his birth story before I forget all of the details. Around 37-38 weeks I had a bit of false labor, I had mild contractions for 3 or 4 days. I kept thinking they would ramp up and they never did, it was super annoying and made me anxious. Once they stopped my uterus was actually sore, it felt like I had done an intense ab work out, my whole pregnancy had been so easy till that weekend of false labor. I was done! I just wanted to meet my little (or not so little) boy. I tried to stay busy, I went to lots of MOMS Club activities. RJ and I took Rosalie and Heather to their first movie at the theater, we saw Incredibles 2, they had so much fun! I tried to finish up the housework, and get laundry, and shopping done. Heather came down with a cold of some sort just a few days before my due date, she had a fever for a few days so I took her to the pediatrician to make sure it wasn’t anything serious. They did a strep test because they had had a few local cases, luckily it was negative. Heather seemed to be getting better and that was a bit of a relief. 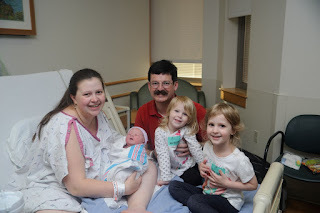 My due date was Saturday, June 30th. Earlier that week I saw my Midwife, I had her check me and strip my membranes. My cervix was still very high and not very dilated. On Wednesday the 27th I started having more contractions that felt similar to the false labor I had a few weeks before. I decided to go to bed and try to sleep through them. Around 3 am I could not sleep through my contractions anymore, I snuck downstairs and did my best to not wake up RJ. I wanted to make sure he got a good amount of sleep, I knew I could handle early labor on my own and if I did need him, he was a few steps away. I bounced on my birth ball for a while, while watching some TV. The contractions were getting worse and worse. They were very sharp. I don’t remember my contractions with Rosalie or Heather being quite so intense, but neither of them was as big as James. I started to lose my nerve a little bit, I didn’t feel great and was spending a lot of time in the bathroom. I was pretty sure James was OP/sunny side up. I put on a lot of weight this pregnancy and just didn’t feel like my best self so I wasn’t feeling as confident as I did with Heather’s labor and delivery. I knew I could do it, I was just feeling anxious. Around 6:30-7am I texted my friend Jocelyn who was going to watch the girls and told her to come over because it was time. I went upstairs, and sat next to RJ on the bed, and said, “Are you ready to have a baby?” He quickly said, yes and jumped out of bed. RJ seemed a little surprised that I had waited so long to wake him up. By the time I woke him, I had stopped timing contractions, I also couldn’t really hold a conversation through them anymore. I knew James was coming, but I knew RJ would be able to be an even better daddy doula if he was well rested, so I only woke him when I needed his help. I called my midwife and told her I was in labor, she told me she would be at the birth center around 8:30 am. RJ and I finished packing our hospital bag and started getting ready to go, Rosalie and Heather woke up and seemed a little confused that every few minutes mommy was leaning against the wall and breathing deeply. Jocelyn showed up pretty quickly, which was good because right after she got to our house, I started to feel pressure, and almost felt the need to push. I told RJ we needed to leave NOW. He can read me very well and knew I was serious. Right before we got in the car, I called my midwife again and told her we were on our way. I hate to ride in the car during labor! Contractions in general hurt like hell, and not being able to move and find a comfy spot makes everything much more intense. Luckily, we made good time and I wasn’t in the car very long. When we got there, I went to the bathroom, then took my pants, underwear, and shirt off. My midwife asked if I wanted her to check me, I said yes, she told me that I was 9cms, I was very excited/relieved to know I was that far along. We had lots of help in the room, there were 3 midwives, 4 nurses, and 1 nursing student who I was happy to have there. Students have to learn somehow and I am not shy. I’m glad I didn’t hire a doula, we had more than enough help and everyone was absolutely amazing. We got settled and I started to really feel the need to push, we tried multiple positions till I ultimately felt comfortable on my side, with one leg up on a peanut ball supported with lots of pillows. This is where things get a tiny bit foggy. When I am in labor, I zone out during the end when contractions are more intense. I labored on my side for quite a while, the nurses kept telling me how amazing I was and how easy I made it look. I was feeling pretty good and a bit more confident now that we were at the birth center, and I knew I didn’t have much longer to go. I don’t exactly remember when I started pushing, but during one contraction I could no longer breath through the pressure and started working with it. My midwife checked me and told me James was well on his way and she had a hard time not breaking my water, I told her it was ok to break it. My water has never broken on its own and I remember the relief of pressure that happened when my midwife broke my water when I was in labor with Heather. My midwife broke my water and things started progressing quicker. I started pushing harder. I don’t remember feeling Rosalie or Heather move down with every push, but with James, I could really feel the progress I was making and it was very motivating. I moved onto my hands and knees and tried pushing there for one or two contractions but I was not as productive there. I rolled over onto my back where my pushes were much more productive. Things got intense very quickly, I reached down and felt his head as soon as he was down far enough. I also asked for a mirror. I am a very visual person and seeing my progress helps so much. I don’t know exactly how long I pushed, but the ring of fire with James felt like an eternity with his big head. The pain almost made me feel more alert. I remember crowning and the pain being excruciating, trying to breathe through it was tough but I was doing it. My midwife told me I could do tiny pulse like pushes and I did and his head came out! I did one last big push and caught him myself and brought him up to my chest. James Robert Ayres was born June 28th, 2018 at 10:45 am. He was 9lbs 14oz, and 21 inches long. He was adorable and everything I imagined he would be. I got to hold him on my chest for over an hour. He was so alert and latched perfectly the first time he tried. James was perfect and while we bonded my midwife left to see how another patient was doing at the main hospital. When she got back the nurse had just weighed him. When my midwife was told he was a whopping 9lbs 14oz she was shocked, most women with babies so large have longer, more difficult labors. Before the placenta was delivered, my midwife checked me for tearing and thought she saw a minor tear but it was difficult to tell with all the normal swelling and blood around my perineum. A day or two later things felt like they were healing very well so I had RJ take a good look down there. He decided I did not tear, and maybe just had a small graze. When I saw my midwife for my 6-week checkup she told me everything looked amazing and it did not look like I had just given birth to a 10lb baby! The only issue I have had since James’s birth is my tailbone. Since he was sunny side up, he did a number on it, and 4 months later it still hurts occasionally. My midwife said I could have sprained it or even fractured it, but there is really nothing that can be done for an injured tailbone. It sounds crazy but I love giving birth. If I wasn’t squeamish around blood other than my own I would love to become a doula or even a midwife. This labor and delivery was rough though. For a while, I thought I wanted six kids, but now I only want one more. Four is a good number. But after giving birth to James naturally and surviving I can do ANYTHING. 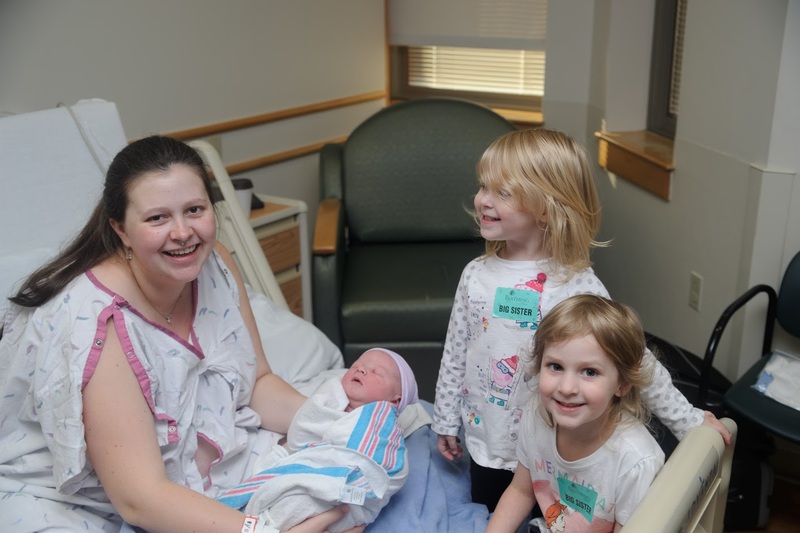 I am glad I am able to share my birth stories. 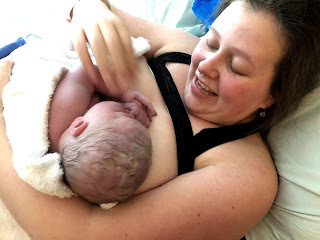 I recently discovered after reading Rosalie and Heather’s birth stories, a friend of mine decided she wanted a natural birth! She had an amazingly supportive birth team and had her own baby boy naturally around the same time I had James! I am glad sharing my experiences have done something. I didn’t know if they would do anything at all when I first started sharing them, so I am really glad that they have helped people! Hopefully, I can find time to blog a bit more often! I love sharing my experiences and opinions.